Get the best luxury charter yachts for your next affair with the help of Charter One. Get your upcoming party plans in order with a Charter One yacht party rental. This is your social event of the season and you want the very best venue, cuisine, service, and accommodations. 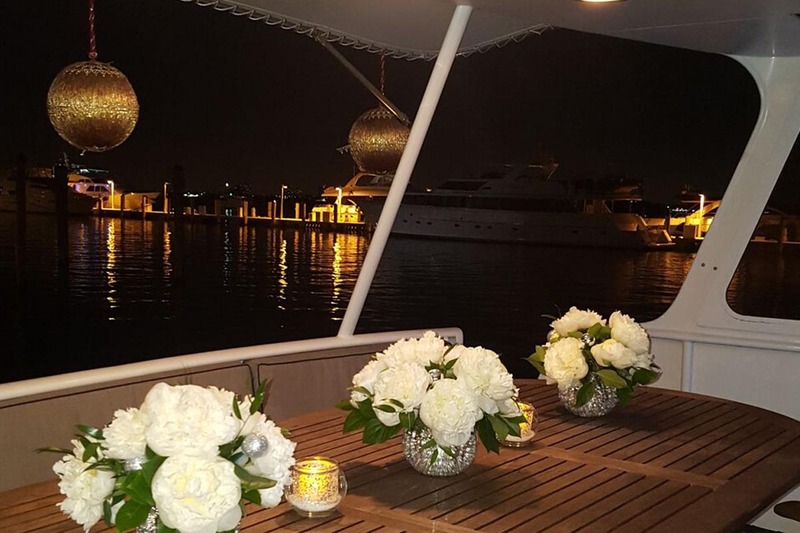 We have it all and that is why our luxury yachts are your best choice for an outstanding party celebration. Enjoy stunning vistas of Florida’s beautiful intracoastal as you and your guests sail through soft breezes and sunshine. Our gorgeous yachts are designed with a light contemporary décor and are equipped with all the modern amenities required to make your party a huge success. We serve some of the finest cuisine in south Florida, prepared by our celebrated chefs aboard ship in the galley. And you and your guests can enjoy excellent service from our super-friendly staff, plus a full-service bar to quench your thirst. If your loved one is having an upcoming milestone birthday, you may want to surprise him with a unique and stimulating yacht party rental. We have affordable packages that can meet both your expectations and your budget, and the best part is that you don’t have to lift a finger. Our great party planning team is ready to speak with you about your event and what you would like to have. You can also spice it up by adding a theme to your party if you wish. Our charter yachts party team will take your vision and create a fabulous party that will be fun and memorable. We work with vendors who supply all the resources you may want for your party, including: floral arrangements, tableware and linens, live band or DJ, decorations and props, custom cakes, photographer, live entertainment etc. Party themes can run the gamut of: a romantic dinner and dancing, Las Vegas casino, masked ball, mystery night, sports tailgate grill, or a Latin or big band dance party. Whatever you think would be appropriate as a theme can be included on your party list. Charter One yacht rentals are known for their fantastic food prepared and served with the freshest ingredients. Our chefs do a great job in the galley and are extra diligent about preparing food for guests with dietary or allergy restrictions. We offer a wide array of menus, including: Italian, Asian, American, Vegetarian, Thai and more. As an option, we also have add-on stations that feature amazing extras like: a Viennese Table, Cappuccino/Café, Sushi, Fruits and Cheeses, Meat Carving Station, Pasta and much more. Our gorgeous charter yachts have custom full-service bars and we also serve non-alcoholic drinks too. You guests will be thrilled with our great cuisine as they sample helpings of: Spanikopita, Leg of Lamb, Chimichurri Beef Satay, Crab Cakes, Salmon, Chicken and Shrimp Sambucca, N.Y. Strip Steak, Paella, Vegetable Medleys, Salads and so much more. Our yacht rentals serve a delectable feast that you will be proud of. You can select one of our yacht rentals once you know how many guests will be in attendance. For large parties of up to 550 guests, we suggest the stunning 128-foot Grand Floridian yacht party rental. This amazing vessel has four decks and all the latest amenities, including: state of the art media capability, 13 HD TV’s, elevator service, multiple dance areas, and private staterooms below deck. Our beautiful Summer Wind yacht is the perfect choice for smaller affairs with up to 60 guests in attendance. This beauty has three decks, a swim platform, plush lounge areas and much more. To begin making plans for your next party and learn more about our superb charter yachts, contact Charter One today at: 954-771-0102. Planning A Corporate Yacht Charter Party? Leave it to Charter One Yachts.